SOS!! 22 hours with no wifi!!!! In the past 48 hours, two different family members in different households have reported problems with their Windows 10 laptops’ Wi-Fi connections. Some basic troubleshooting â€” restarting the modem/router, verifying other devices could connect â€” demonstrated that the issue was with the laptops. 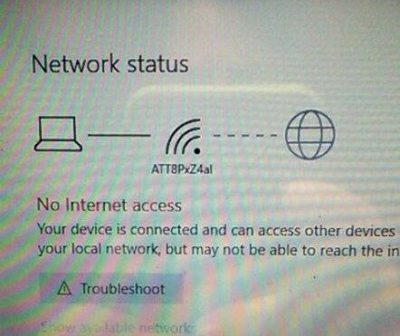 The laptop was connected to the Wi-Fi access point, with full signal strength, but there was no connectivity beyond that connection. 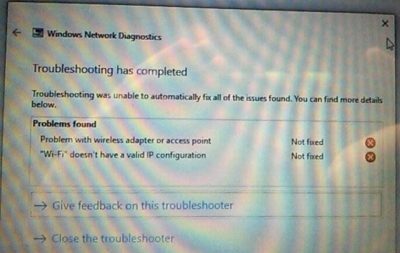 The Network Troubleshooter didn’t resolve anything, but it did mention something useful. It reported that the “Wi-Fi” adapter had an invalid configuration. Then we rebooted, and the system came up and connected to Wi-Fi and the Internet was available again. Subsequently, I found this Microsoft support article entitled Fix network connection issues in Windows 10, which covers may of the steps we tried as well as the steps that resolved our issues. In Windows 10, if you run Netsh interactively, you see a notification that Netsh is deprecated, and to transition to the admittedly awesome PowerShell modules for managing TCP/IP. However, giving the specific behavior of the netsh interface ipv4 reset command (overwrites registry information; see the More Information section of https://support.microsoft.com/en-us/kb/299357), I’m not sure what PowerShell command would accomplish the same end. Something to look into. This entry was posted in Posts and tagged netsh, network, Troubleshooting, windows10 on December 9, 2016 by Geoff. netsh advfirewall firewall set rule name="Windows Internet Naming Service (WINS) (NB-Name-UDP-In)" remoteip="10.10.0.0/16,10.11.0.0/16,10.12.0.0/16"
For ‘set’ commands, the ‘new’ keyword must be present and must not be the last argument provided. Values after the new keyword are updated in the rule.Â If there areÂ no values, or keyword new is missing, no changes are made. netsh advfirewall firewall set rule name="Windows Internet Naming Service (WINS) (NB-Name-UDP-In)" newÂ remoteip="10.100.0.0/16,10.101.0.0/16,10.102.0.0/16"
This entry was posted in Posts and tagged administration, cli, network, Server2008R2, ServerCore on April 14, 2014 by Geoff. Itâ€™s one of the first questions that we ask clients when weâ€™re helping diagnose a problem with a network resource. There are several different ways to determine your IP address. Thereâ€™s even a website, whatsmyip.org which will show you what Internet servers think your IP address is. In this post, I describe how to determine your IP address(es) on Windows 7 using the control panel. You can also use the ipconfig command-line tool, but if you know about that tool, you probably donâ€™t need me to tell you about it. One of my favorite aspects of Windows 7 is the search feature in the start menu. As you type a search term, Windows will show you matching programs and documents. 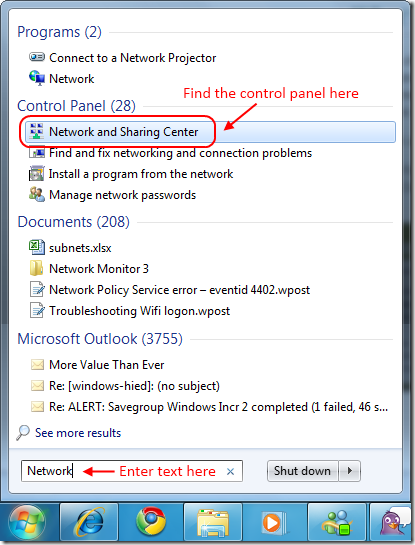 As a case in point, you can type Network in the Start Menu search box, and click the Network and Sharing Center control panel item in the search result. 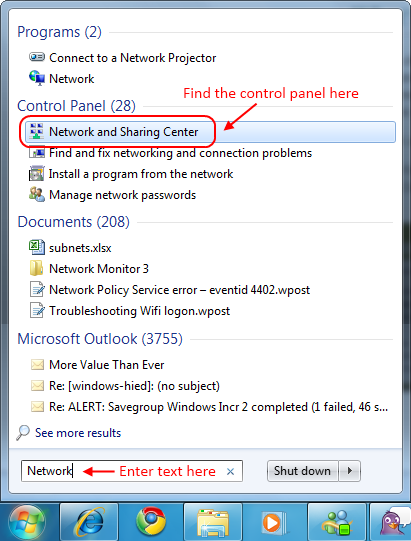 Alternatively, you can open Control Panel, then Network and Internet, and then click the Network and Sharing Center item. This entry was posted in Posts and tagged network, Windows7 on January 19, 2011 by Geoff. Iâ€™ve been working with client to try to identify why we sometime log onto the UVM wifi network successfully before workstation logon, but frequently this fails and drive mappings are not performed successfully. In consulting with a colleague, he suggested that it could be a race condition between the network authorizing the connection and the Windows system DHCP Client behavior. PDF book discussing TCP/IP protocols and services, and their configuration. Over 500 virtual pages. Now this is good detail! I have to review this blog in more detail. This entry was posted in worklog and tagged dhcp, network, Vista, wifi on June 4, 2009 by Geoff. The Inside Office Online blog post for the video includes links to the interactive guides for the big five office applications. I havenâ€™t watched the whole thing, yet, but it also links to video of a presentation that discusses the evolution of the ribbon interface. My son and I watched the first ten minutes or so before bed last night, and heâ€™s interested in watching the rest. Hurray for GeekKids! I got the windump capture to work, using the local computer policy startup script setting. I did the same thing using the nmcap.exe command-line component of Microsoftâ€™s Network Monitor 3.2. And one thing I learned is that I donâ€™t know nearly enough about network communications. 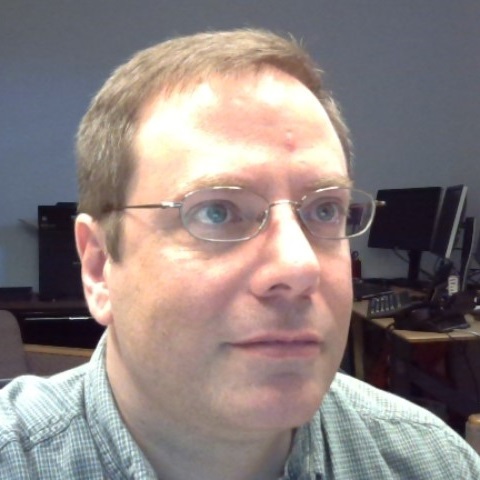 This entry was posted in worklog and tagged kerberos, network, Office2007, Vista on April 17, 2009 by Geoff. This entry was posted in Posts and tagged cli, netsh, network, Vista on July 10, 2008 by Geoff.